Spencer Tracy, Katharine Hepburn in George Cukor's Adam's Rib. Home movies of scary folk such as Alfred Hitchcock and Richard Nixon (and of some non-scary celebrities and non-celebrities as well), in addition to film classics and/or rarities starring Marilyn Monroe, Thelma Todd, Ken Maynard, Spencer Tracy, Katharine Hepburn, Tony Curtis, Jack Lemmon, Dustin Farnum, Diane Lane, Judy Holliday, Michael Paré, Olivia de Havilland, and Errol Flynn will be screened at the Library of Congress Packard Campus for Audio Visual Conservation in Culpeper, Va., in September. Packard Campus highlights include both the obvious – Michael Curtiz and William Keighley's masterful The Adventures of Robin Hood (1938), George Cukor's delightful comedy Adam's Rib (1949), Billy Wilder's entertaining, gender-bending Some Like It Hot (1959) – and the obscure: two Thelma Todd features, two Ken Maynard oaters, and one silent featuring Dustin Farnum (no relation to Dustin Hoffman, but close relation to William Farnum). Thelma Todd, Turner Classic Movies' “star of the day” just yesterday, is featured in both You Made Me Love You (1933), a British production with Stanley Lupino (Ida Lupino's father), and Air Hostess (1933), a B movie with James Murray, the leading man in King Vidor's The Crowd (1928). Todd would die under mysterious circumstances – her death ruled a suicide – two years after Air Hostess was released. Murray, reduced to playing bit parts in movies, would kill himself the following year. The two Ken Maynard Westerns are the Poverty-Row productions Texan Gun Fighter (1932) and Lightning Strikes West (1940). I'd never heard of either movie. Needless to say, I've never watched either one. In fact, I don't think I've ever sat through a Ken Maynard Western. That's a good enough reason for me to find this presentation well worthwhile. Dustin Farnum, though not as popular as brother William Farnum, had quite a following in the 1910s. The Packard Campus will be showing The Corsican Brothers, in which Farnum has a dual role. As an aside: Dustin Farnum has the distinction of having starred in Cecil B. DeMille and Oscar Apfel's 1914 Western The Squaw Man, officially the first feature film shot in Hollywood. Packard Campus programs are preceded by a slide presentation about the film, with music selected by the Library's Recorded Sound Section. Some screenings will also include short subjects before the main feature. Titles are subject to change without notice. Schedule and film synopses from the Packard Campus press release. When two Roaring 20s musicians witness a mob hit, they flee the state in an all-female band disguised as women, but further complications set in. This classic comedy was selected for preservation in the National Film Registry in 1989.Directed by Billy Wilder, “Some Like it Hot” stars Marilyn Monroe, Tony Curtis and Jack Lemmon. Friday, Sept. 10, 7:30 p.m. The bandit king of Sherwood Forest leads his merry men in a battle against the corrupt Prince John. Directed by Michael Curtiz, this action-adventure film was named to the National Film Registry in 1995. “The Adventures of Robin Hood” stars Errol Flynn, Olivia de Havilland and Basil Rathbone. Saturday, Sept. 11, 2:00 p.m.
Merlin the Magician teaches a young boy who is destined to become King Arthur. This animated family adventure was directed by Wolfgang Reitherman and features the voices of Rickie Sorensen, Karl Swenson and Sebastian Cabot. Two ex-outlaws thwart their old gang's plan to steal a gold shipment. Directed by Phil Rosen, this Western stars Ken Maynard and Lloyd Ingraham. When Butch Taggart escapes prison, the marshal sends Lightning Morgan to find him and his hidden gold. Harry L. Fraser directed this Ken Maynard Western, which also features Michael Vallon and Reed Howes. Friday, Sept. 17, 7:30 p.m.
A mercenary goes after his singer ex-girlfriend who has been kidnapped by a gang. This stylish, futuristic fable, set to a rock music beat, was directed by Walter Hill. Michael Paré, Diane Lane and Rick Moranis star in this romantic adventure. Saturday, Sept. 18, 7:30 p.m. This is an early adaptation of the Dumas novel of revenge and love in 19th-century Corsica as two feuding families are caught up in a centuries-old tradition of vendetta. Directed by Colin Campbell, this silent film stars Dustin Farnum. This silent comedy short stars Buster Keaton. Both showings will feature musical accompaniment by Andrew Simpson. Wednesday, Sept. 22, 7:30 p.m.
Archivist Rick Prelinger presents a special program showcasing a collection of amazing — and nearly lost — amateur films and home movies that celebrate a vibrant, busy and productive Detroit from 1917 through the 1970s. Thursday, Sept. 23, 7:30 p.m.
Husband-and-wife lawyers argue opposite sides in a sensational women's rights case. One scene in the film features the couple watching a home movie. Named to the National Film Registry in 1992, this romantic comedy was directed by George Cukor. The film stars Spencer Tracy and Katharine Hepburn. Friday, Sept. 24, 7:30 p.m.
A compilation of 16 home movies and amateur films from American film archives, including home movies of Alfred Hitchcock, Smokey Bear and Richard Nixon, plus comic shorts, dramas, historical events and family scenes from around the country. Saturday, Sept. 25, 7:30 p.m.
Trouble ensues when the bachelor friend of a henpecked husband talks him into sneaking out for an afternoon of fun and frolic with a couple of shop girls. Directed by Harry Edwards, this comedy stars Harry Langdon, Vernon Dent and Alice Ward. The screening will also feature two silent Mack Sennett comedy shorts. The Snark Ensemble will provide musical accompaniment. A modern-day redo of Shakespeare's “Taming of the Shrew” with song-and-dance man Stanley Lupino falling for the temperamental beauty Thelma Todd. Monty Banks directed this comedy. A plucky stewardess risks her life marrying a daredevil pilot. Directed by Albert S. Rogell, this drama stars James Murray, Evalyn Knapp and Thelma Todd. 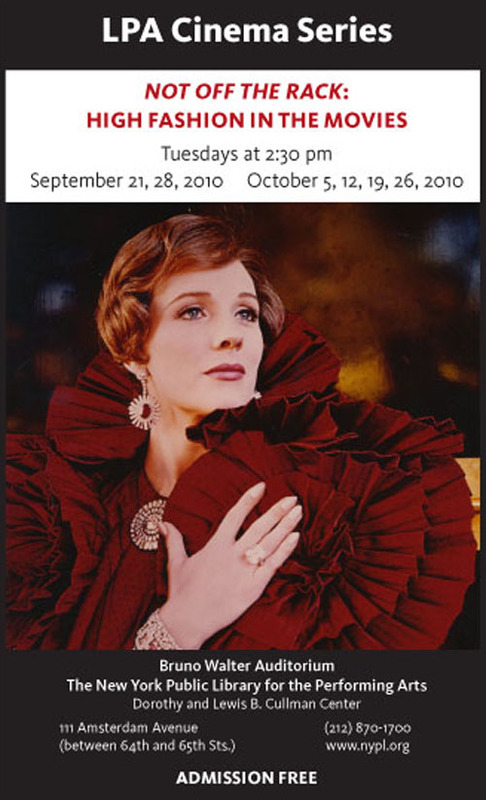 Julie Andrews as Gertrude Lawrence in Star!. Julie Andrews, Gloria Swanson, Lauren Bacall, Cary Grant, Linda Darnell, George Hamilton, Melvyn Douglas, and Louise Brooks are some of the female and male clotheshorses on parade in the New York Public Library's Performing Arts film series “Not Off the Rack: High Fashion in the Movies,” which kicks off on Tuesday, Sept. 21, at 2:30 p.m. The series will run every Tuesday through Oct. 26. Admission is free. Arranged by guest programmer Joseph Yranski, “Not Off the Rack” will present seven movies: the double bill Tonight or Never (1931) / Prix de beauté (1930), The Fan (1981), Star! (1968), That Touch of Mink (1962), Unfaithfully Yours (1948), and Love at First Bite (1979). Featured costume designers include Coco Chanel, Jean Patou, Oscar de la Renta, Donald Brooks, and Halston. “Not Off the Rack” is being presented as a tie-in to Fashion Week, along with the NYPL's exhibition “On Stage in Fashion: Designs for Theater, Opera, and Dance,” on view in the Donald & Mary Oenslager Gallery from next Oct. 14 to Jan. 22, 2011. The LPA Cinema Series is made possible with public funds from The New York State Council on the Arts, a State Agency. Admission to all programs is free and on a first come, first served basis. For information, please call (212) 870-1700 or visit www.nypl.org. Programs are subject to last-minute change or cancellation.